If you took a train on the Woolwich line around 10 years ago, Deptford was probably the quietest station on the whole route from Dartford. A handful of people would get on or off. That’s changed. Numbers have quadrupled in 9 years – from 300k in 2004/5 to 1.2 million in 2013/14. On a post last year I listed growth at all stations along the line in 2013/14 and Deptford came top with an annual 11.7% increase. Yet ticket office hours still seem to be based on passenger numbers from 10 years ago. There’s no weekend staff, and on weekdays it’s open from 6:40 am to 17:25. Compared to most other SE stations, that’s not exactly impressive. According to Network Rail, Maze Hill, to give one example, sees around a million passengers a year yet its ticket office is open Monday to Friday from 06:10 to 19:30, and also on Saturday’s from 06:10 to 19:30. I don’t see very strong growth slowing any time soon, so do Southeastern have plans for increasing the ticket office times and staffing? Probably not unless the franchise agreement calls for it, and that means Whitehall and the Department for Transport pushing it. Given their lack of effort on the SE London and Kent network going back many years, with issues such as no additional trains despite almost all other London train companies receiving them, then hopes probably aren’t too high. Next week sees ‘Creekside Wharf‘ before Greenwich’s planning board. The plans are for 249 new flats and 800 residents by 2017. I’m writing up a quick post about it that should hopefully go up this week. It’s far from the only development close to Deptford station. 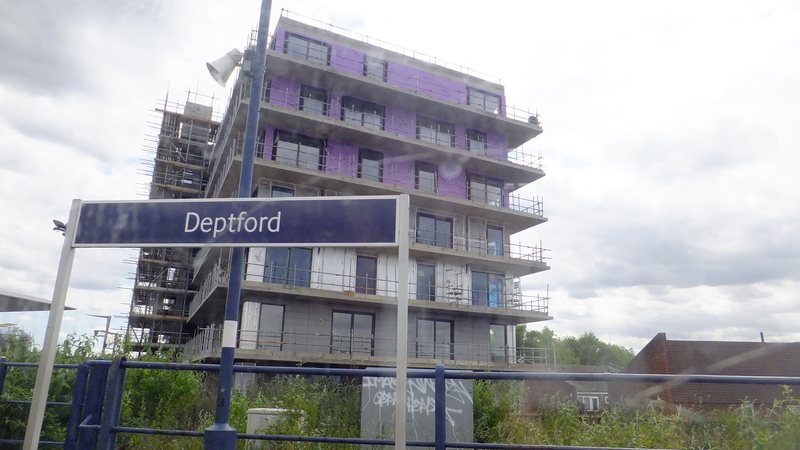 As the main picture above shows, the Deptford Project beside the station is nearing completion. Residents should begin moving in at the end of this year. Many others will line the Creek in coming years. Growth is unlikely to slow anytime soon. If more people realised Deptford station was only 6 minutes from London Bridge and 10 from the City and Cannon Street, station numbers would probably spike even more. If TfL had managed to take over and it appeared on the tube map, then numbers would likely rise even more sharply. Though TfL would have staffed it from first train to last, unlike Southeastern under the orders of the Department for Transport. Not being on the tube map also hampers Greenwich station. A large number of people get there via a convoluted, slower (but enjoyable) trip through Canary Wharf on the DLR. If TfL took over they also would have very likely procured extra trains for the area, which the DfT refuses to provide. “The latest trains, known as Aventra trains, will operate on the Liverpool Street to Enfield Town, Cheshunt (via Seven Sisters) and Chingford routes, which became part of the Overground network on May 31. They will be also be used between Romford and Upminster and the Gospel Oak to Barking line, after that it is electrified in 2017. South of the river and its a case of waiting for some scraps to be given, but no guarantees of anything anytime soon. Well, in the South East that is. Southern and South West Trains are seeing many additional trains at the moment and in coming years. As for Southeastern, more staff? More trains? Usage is only going one way.